A CNC aluminum piston head can increase the performance and durability of your AEG, and Matrix has designed a unique model that comes with a built in airbrake, something rarely seen on AEGs. The downside of aluminum piston heads is that they increase the force inflicted on your gearbox shell, so I only advise using them on reinforced gearboxes, but the increased strength they provide does make them a great option. I will discuss the specifics about this unique piston head in this review, so keep reading for more information! 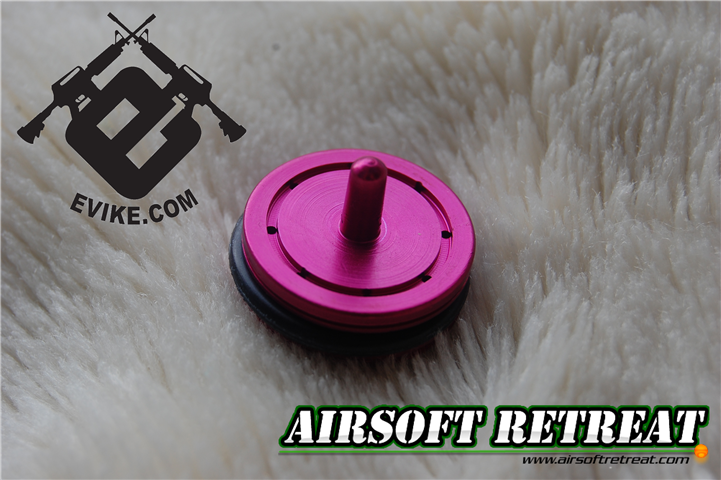 I was sent this piston head by Evike, who has it available HERE, priced at $20. This price is on par with most other aluminum piston heads from other manufacturers. I received it 2 days after ordering through UPS ground shipping, which is Evike's free shipping option for orders over $100. There are a few schools of thought regarding airbrake piston heads. The main theory is that once the extended airbrake section enters the hole in the cylinder head, it creates compression inside the cylinder, slowing it down before the main body of the piston head impacts the cylinder head. This does two things: reducing the impact energy transferred into the gearbox shell, and quieting down the sound of the impact as well. Usually, you see airbrakes on bolt action sniper rifle pistons and almost never on AEG pistons. Matrix didn't go too crazy with the packaging on this thing as it all comes wrapped up in a small foil bag. There are no labels on the packaging at all to indicate the product name, however, it has a plastic window on the bag to see the parts held within. The Devil piston head is CNC machined out of T6061 aluminum with a purple anodized finish, and comes complete with a ball bearing base to prevent binding while firing. They also include a high quality O-ring, basically giving you everything you need to install it. For my testing, I installed it on an Element polycarbonate piston, which I've found to be a good quality unit for mid level (M120 or so) springs. The gun I will be testing it in is my ever evolving ICS Sportline M16. Before installing the new piston head, I did some baseline FPS reports using the same piston, but with an SRC aluminum piston head. The weight between the two piston heads feels similar, but I don't have a precise enough scale to see the actual weight. With the SRC piston head and a tapered aluminum cylinder head I was getting between 378.6 and 381.9 FPS, with very little deviation between shots. After installing the Matrix piston head, I was getting similar results, between 380.4 and 384.7 FPS. The FPS was slightly higher, and consistency was about the same. The ROF was unchanged between the two, and the gun does seem to sound a bit quieter when shooting. I changed out the tapered cylinder head for a polymer flat faced cylinder head, and got very interesting results. With the SRC aluminum piston head, I was getting between 410.5 and 414.2 FPS, and the firing was noticeably louder than either piston heads with the tapered cylinder head. I then installed the Matrix piston head and saw a consistent drop in FPS, coming in between 387.6 and 392.0 FPS, and the firing was MUCH quieter than any of the prior tests. Therefore, the airbrake effects of this piston head are best seen with flat faced cylinder heads, as it allows the airbrake to seal up the cylinder sooner. Long term testing will expose any issues or improvements with longevity, so I will be updating this as I test the gun down the line. I'm always excited to try out new and interesting designs, and the Matrix Devil piston head certainly falls into that category. The airbrake design is something that really hasn't been seen on AEGs, and so far, it seems to be working well. Obviously, time will tell as to how well it holds up, but so far, it is running like a champ! The Edelbrock 4.0 Aluminum Performer cylinder head is a bolt-on performance upgrade for 1987-2006 Jeeps with 4.0L inline six cylinder engine. Works with 258 I-6 Too. Half the weight of a Factory Iron Head. Delivers broad power & Torque! !